The day began cloudy and cool. After a pleasant breakfast on the porch overlooking the garden we lingered, relishing the quiet respite from the normal hum of air conditioners and mowers. Sounds of Bluebirds, Cardinals, American Gold Finches, Hummingbirds, and Mourning Doves filled the air and occasionally the wind stirred, initiating and sustaining gentle tones from the new wind chimes in the meditation circle. By early afternoon the sun was shining. With the temperature only in the mid-seventies, well below normal for August, at last it was a perfect day to weed and trim and enjoy the work of the garden. Hungry birds and pollinators made fine company and we each concentrated purposefully on the flowers, stalks and seedpods. In the southern border Lantana camara (Common lantana) has finally come into full bloom. Reaching that stage seems to have taken longer than usual, but the timing suited very well a Hummingbird Moth, Clearwing Moth (Hemaris thysbe). It has a long proboscis (tubular mouthpart) used for feeding, which is coiled up while it searches for nectar. The proboscis is uncoiled to sip from these Phlox Paniculata (Garden Phlox). 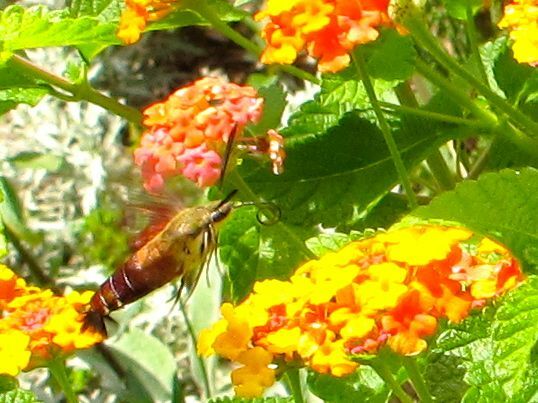 The antennae are distinctive and as the term Clearwing Moth suggests, part of the wings are clear. Following a prolific floral display in Spring, a few Chuck Hayes Gardenia blossoms have appeared throughout the summer. The foliage has stayed green and healthy thanks to all the rain this year. 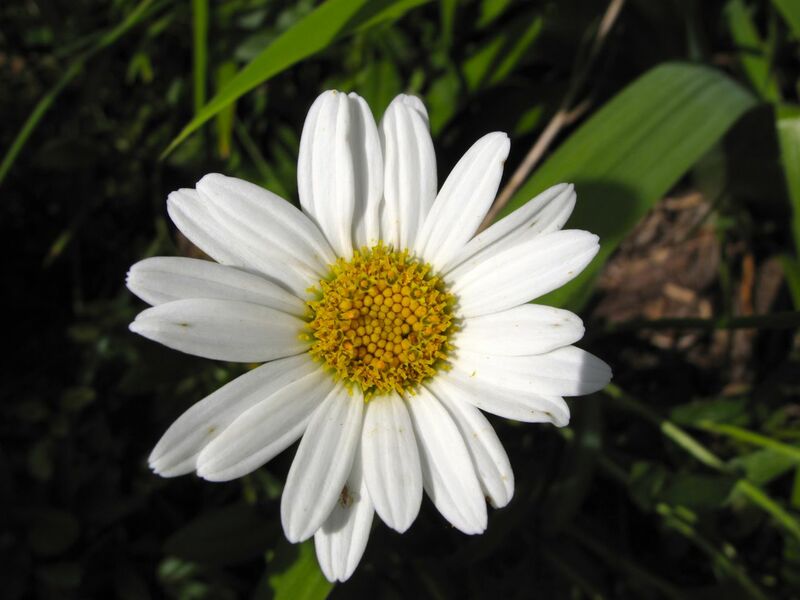 Most of the Shasta Daisies have gone to seed, but there are a few fresh flowers. 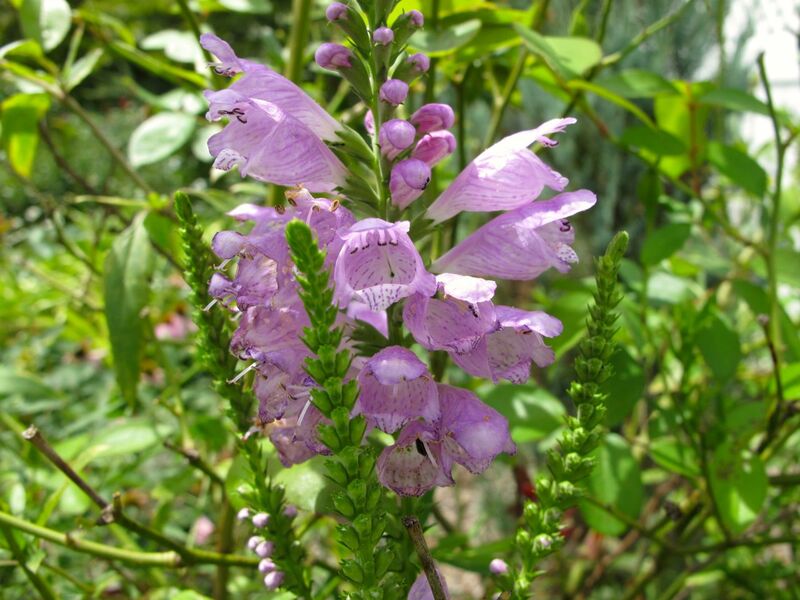 I enjoyed Obedient Plant for years at my former shady garden, but it spreads too much in this sunny setting and sends out long-reaching runners. This has just begun to bloom recently. I pulled some up elsewhere but decided to enjoy this for a few days. 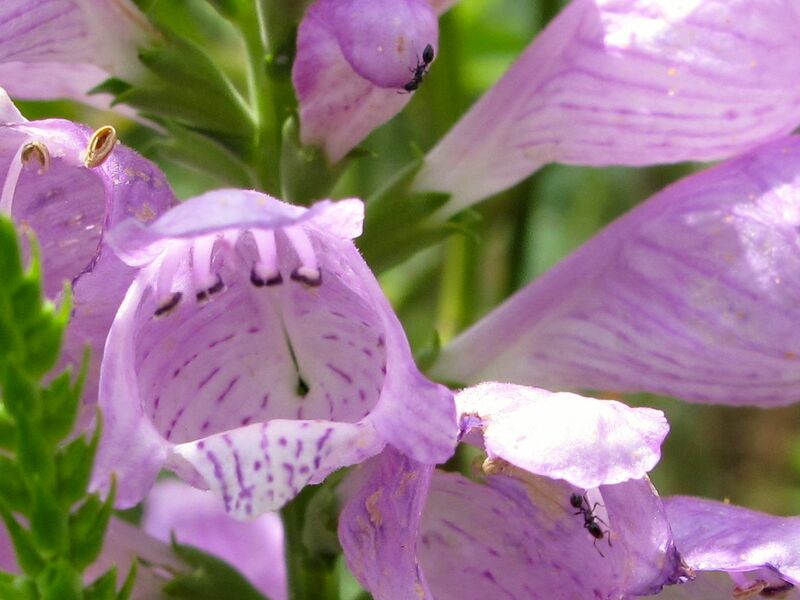 Upon closer inspection one can see a couple of ants are at work on the Obedient Plant. Sedum ‘Autumn Joy’ (Herbstfreude) (Stonecrop) is looking strong this year. Growing among the ‘Autumn Joy’ are a few stems of Salvia uliginosa ‘Blue Sky’ (Bog sage). The ‘Blue Sky’ attracted one of the few bees seen in the garden this year. Last summer it was hard to photograph the flowers without capturing multiple bees in every frame. 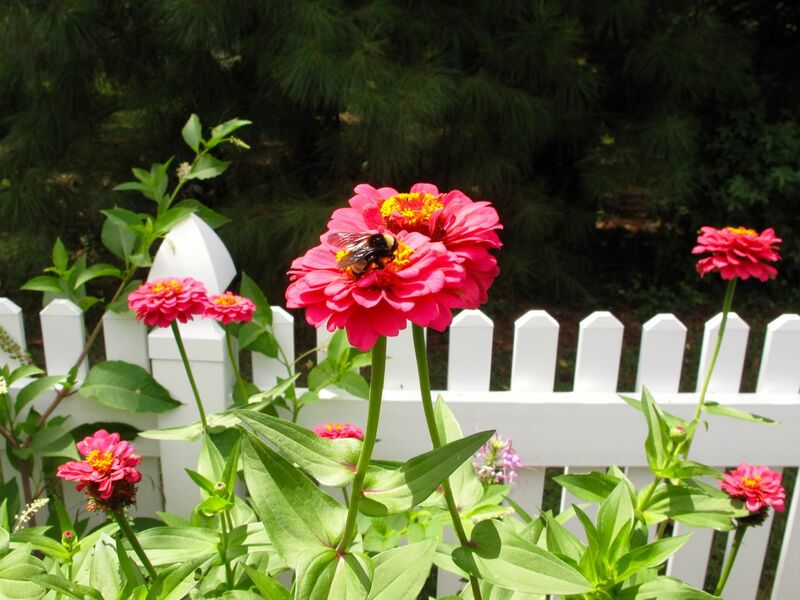 One other bee sipped nectar from the Zinnias that volunteered from last year. 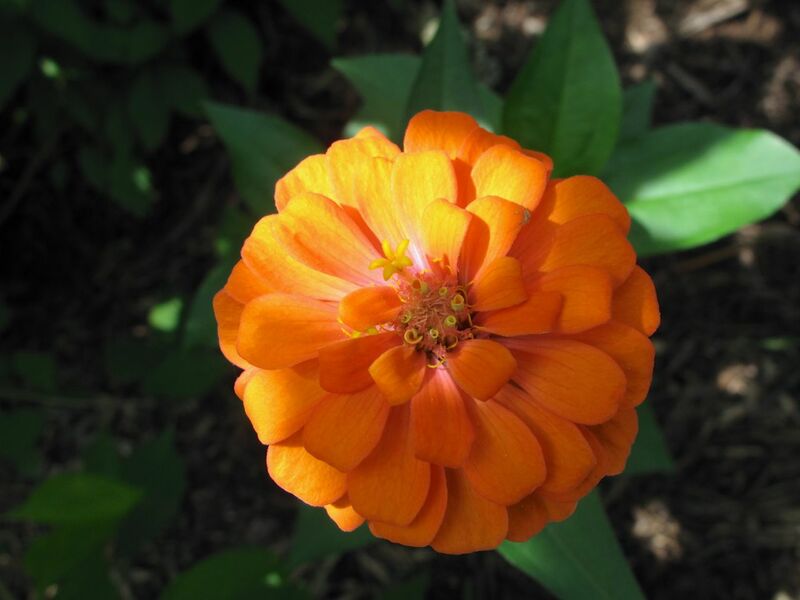 I particularly like the color of this orange Zinnia. 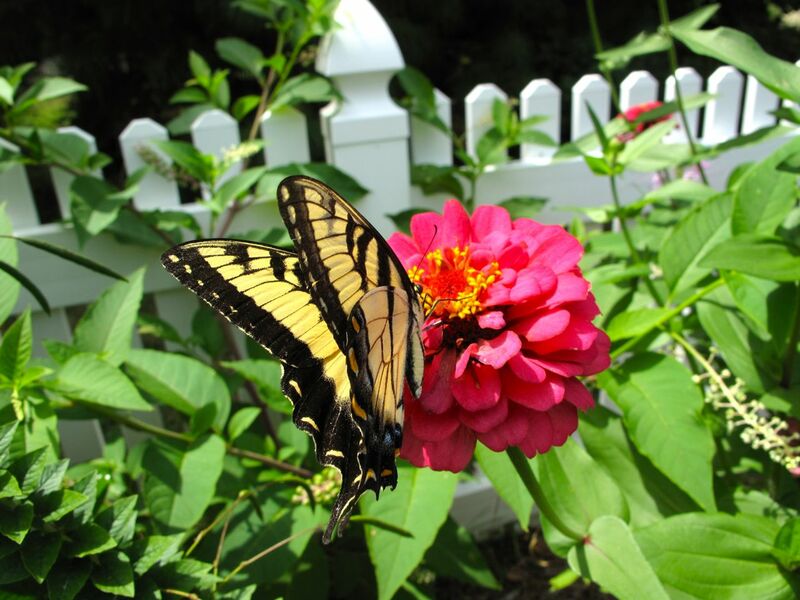 The Zinnias also attracted a colorful Eastern Tiger Swallowtail (Papilio glaucus), the state butterfly. By following the Swallowtail I discovered Phytolacca americana (Pokeweed) has set up camp next to the fence. I like the looks of this plant, but I know it would be hard to get rid of if I let it stay. 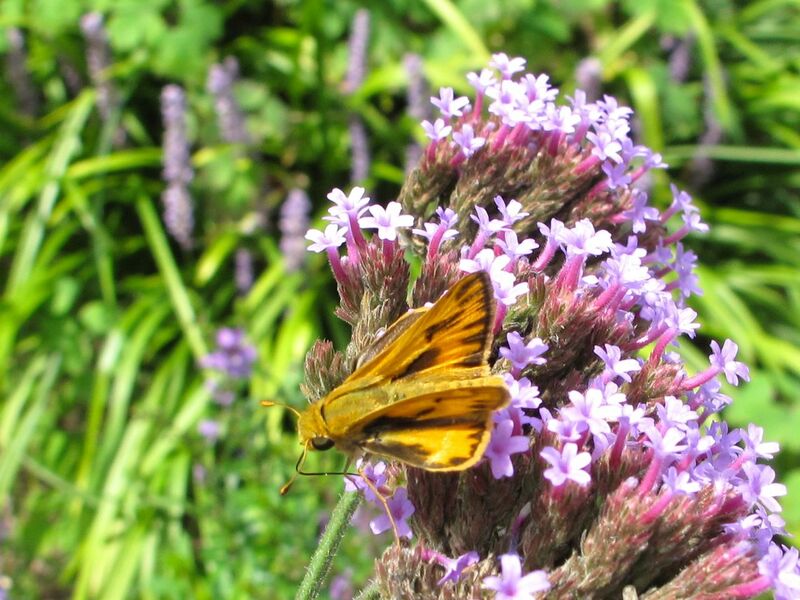 Another unidentified pollinator was attracted to the Verbena bonariensis (Tall Verbena). The American Gold Finches are fond of it too. This entry was posted in garden and tagged almanac, garden photography, late summer garden, pollinators on August 16, 2013 by pbmgarden. I’m afraid I can’t help with identification, but the butterfly is very pretty. 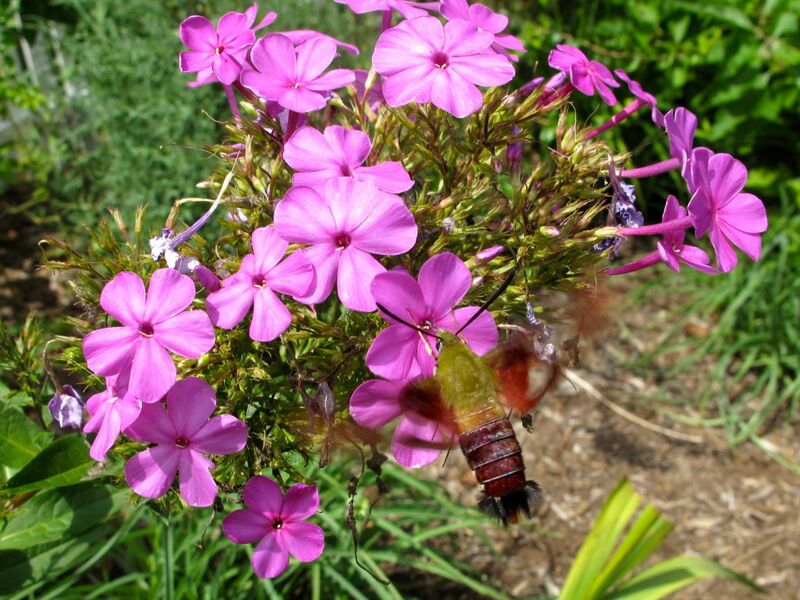 Your hummingbird moth looks very similar to ours, perhaps a little bigger. We have several kinds of them some years, but only the small ones turned up this summer. My lantana (in a pot) is also only just flowering, and rather sparsely. I feel its days are numbered as I don’t have space to overwinter it in a larger pot! Lovely blooms and butterflies Susie. Enjoy the gardening weather! This hummingbird moth seems larger than usual but I read there are three species of them in North Carolina. (Hope I’ve identified it properly.) It’s another beautiful day here and cool again. Thanks for stopping by! Your flowers look beautiful. The gardenias are something beyond beautiful, and I could imagine the wonderful fragrance. 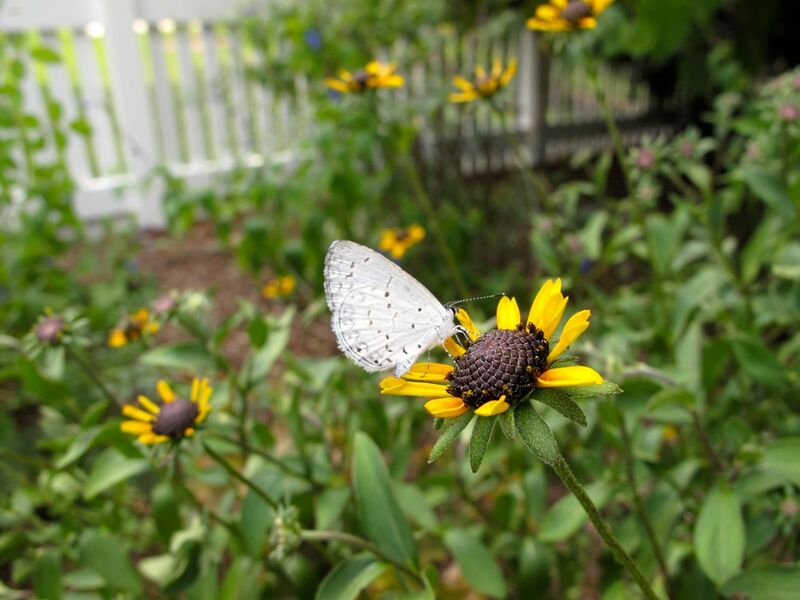 You also captured some nice butterfly shots. You’re lucky because we aren’t seeing any which is very concerning. Thanks Judy. 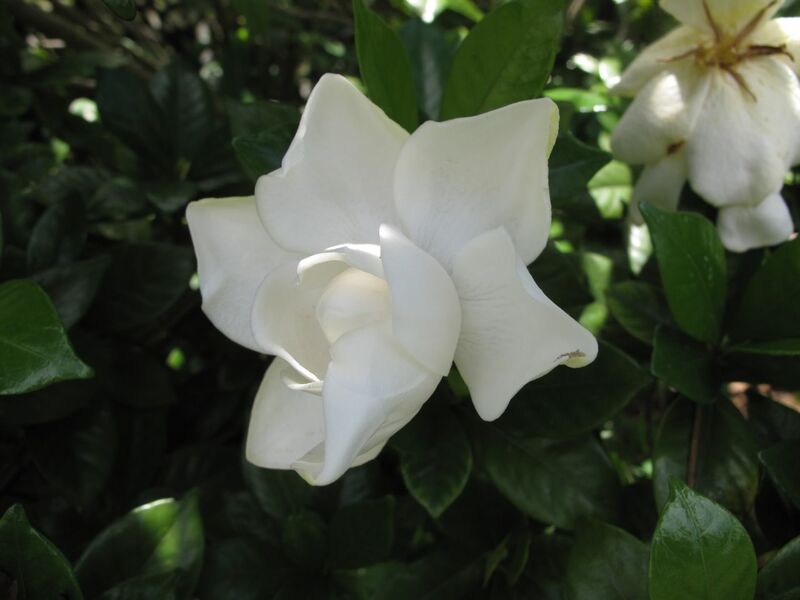 The gardenia is one of my favorites and you’re so right about the fragrance. We’ve had more butterflies and fewer bees. Things look great there and it sounds so relaxing. 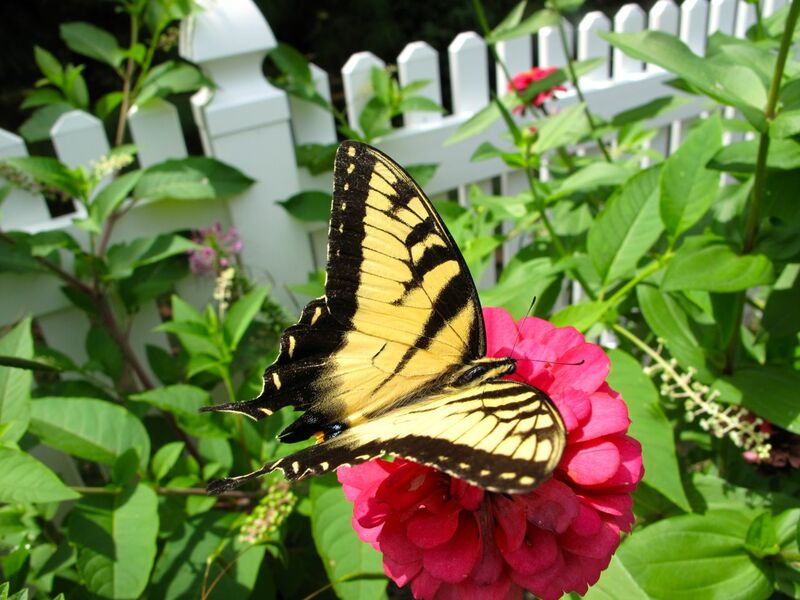 That Tiger Swallowtail looks so fresh and healthy, nice picture! I always call those little brown butterflies ‘skippers’ that’s as far as my ID goes though…. Thanks, I’ll see if I can find a skipper that matches. I’m not very experienced at identifying little creatures. 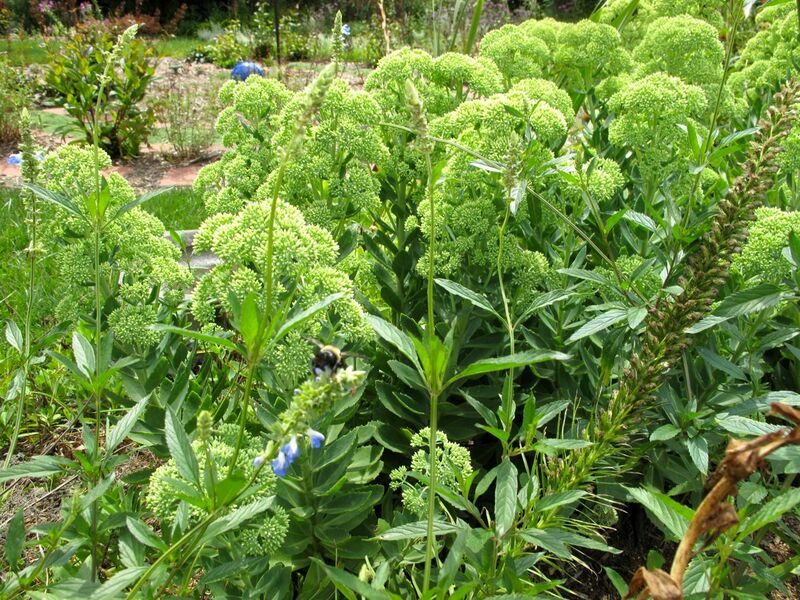 Loving all your critters…the garden is very quiet now…and I too love Obedient….I have to do a major culling as it has over reached in many areas with the goldenrod. Thanks Donna! I try to pull up all the Obedient–it’s back every year. What a treat for the eyes and for the nose if all the pollinators are anything to go by. Great colours, your garden is so alive in August, while mine wants to sleep. It’s a thrill having colors in my garden other than brown this time of year Christina. Yours has been very nice this year. Lovely pictures of flowers and insects. Your butterflies are beautiful and your hummingbird moth is different from ours, it’s always interesting to see what visits other gardens in their search for food. Thank you Pauline. That particular day seemed to be a heavy feeding day and it was fun to watch them all. I’ve seen hummingbird moths before but not often and this one looked a little bigger to me than I’d remembered. 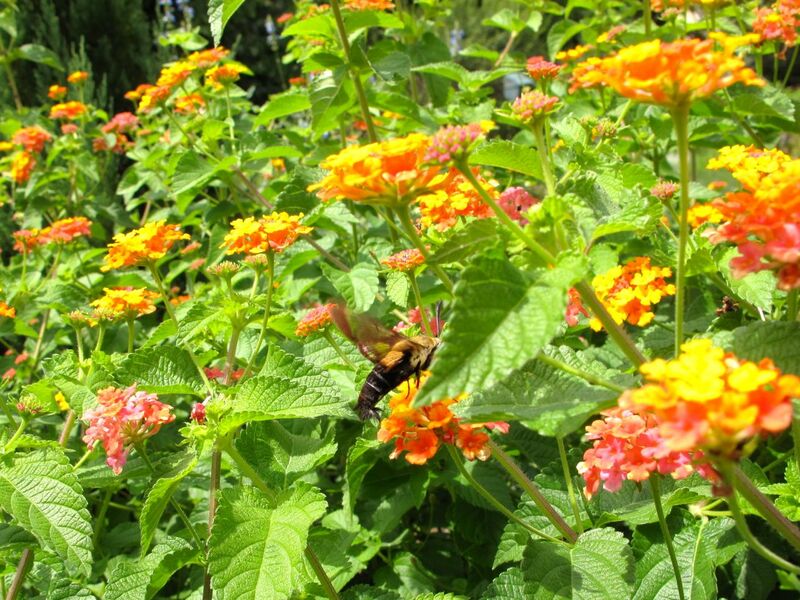 I so wish we could grow Lantana – I feel sure they would attract lots of our butterflies too. Yes, probably so. I watched 3 Swallowtails enjoying the Lantana this morning along with other things I couldn’t identify. Your garden is beautiful. I LOVE your photographs and posts. I thought I was ‘following’ you, but discovered, maybe not????? Anyway, I have clicked on ‘Follow” and hope for the best. 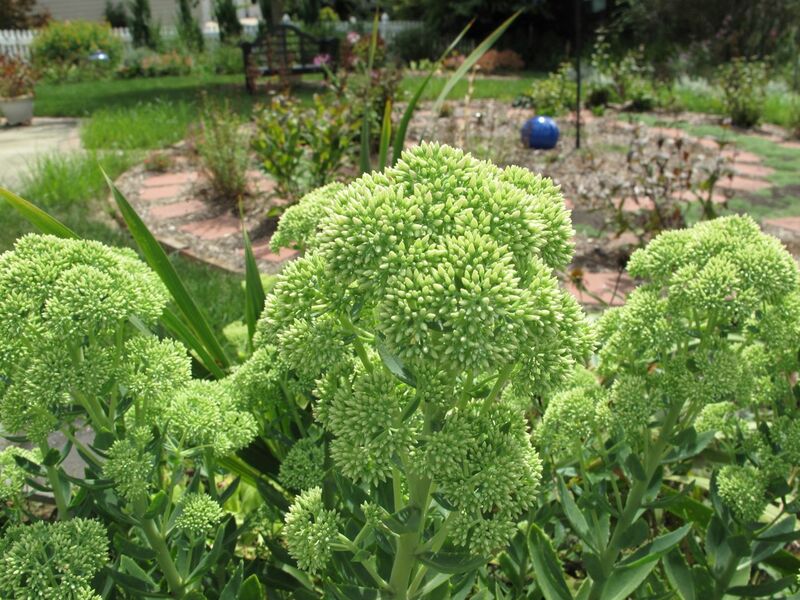 You deserve an award for this beautiful garden and your webpage about it. Stepheny, thanks so much. Glad you have found my blog again. Surprising to still have gardenias.